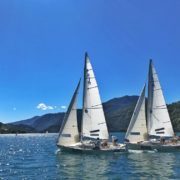 The sixth edition of the Youth Match Racing Worlds will be hosted on Lake Ledro in Trentino, Italy, from the 3 – 8 July 2018. The Notice of Race (NoR) for the 2018 Youth Match Racing World Championships, which outlines entry requirements, sailing rules, course information and event formatting, has been released. Boy’s crew will have three sailors, including the skipper and mixed crews as well as Girl’s crew will be four, per boat. This event consists of four stages; Stage 1 – A Full Round Robin organized, initially, in two semi round robins, Stage 2 – Semi Finals, Stage 3 – Petite Final and Stage 4 – Finals.